jifero, Est matachín, Heb shojet, Eng slaughter, a man who “sacrifices” livestock, a slaughter who does the actual killing and directs the entire operation. The position is more respected than that of a butcher. As in bull fighting, it is an art requiring strength, speed and precision to cut the aorta cleanly with one thrust of the dagger for the death to be painless. 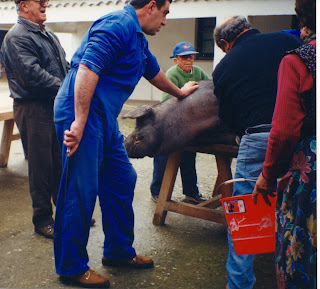 Traditionally the slaughter takes place on the street in front of the owner’s home for all to see the ‘sacrifice’ and to observe the art of cutting up the carcass, such as removing the bile, chopping off the hooves and separating the meat from the lard and fat. It does seem ironic that Protestant England slaughters or butchers its animals but in Spain animals, especially pigs, are “sacrificed”. Pope Gregory III prohibited sacrifices in the name of the RC Church. The local Spanish priest, however, continues to be given the best cut after the slaughter. Not fulfilling this tradition would be unthinkable. At the end of the three days during which the slaughters are performed and the meats prepared, the local priest says mass to bless the slaughter in return for the meat he receives. The Jewish rabbi did not wait for his portion for it was in his hands. He was the matarife of the Jewish community. In Tetuan, he was called the Wiseman. The animal was killed with one blow; it died two or three minutes after that. All the blood was drained from its body, as it was unclean to eat that. The law prohibited Jews from purchasing meat killed by Christians but not the other way around. In Trujillo, Estremadura, Christians bought meat from the Jews and even the king ate meat prepared by them during his visits there as reportedly Jews were the best slaughters in the area and sold the best meat. Still in the 21th C the rabbi kills cattle and oxen. Muslims in Spain had their own slaughter-man and to this day, “sacrifrice” their animals instead of animals instead of killing them. 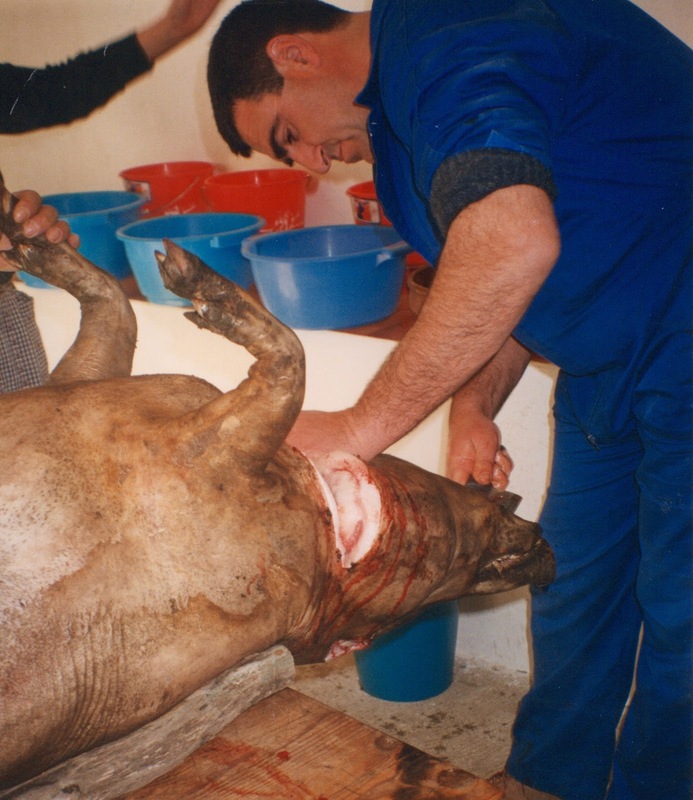 As the Jews, they slit the throat of the animal rather than the aorta as Christians do. The blood from Jewish and Muslim beasts is let to run out on the ground as it is not considered consumable and the animal is purified with prayer. Further, Jews soak meat in water five or six times with salt to insure there is no blood left. They also removed the sciatic vein from the joints. Larding meat is unheard of in Jewish communities as all fat is removed from the beast. At midday, the slaughter was served a humble dish but one of his favorites. Groats were popular. Soak the second cup of chickpeas overnight. Rinse and boil the following day. When soft let cook. Peel and chop onion. Sautée in olive oil. Grind pepper and mix with chopped herbs and garlic clove. Mix with chickpeas. 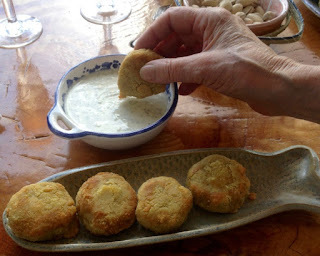 Add 1 tbsp chickpea flour and mix well. Make burgers with this mixture. 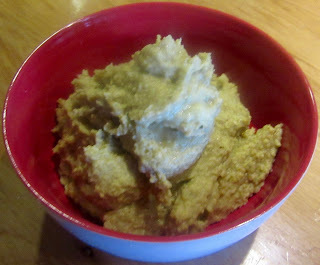 Put the remaining chickpea flour in a bowl. Roll burgers in the flour. Heat olive oil in a frying pan. Add burgers. Turn when browned and remove. Serve warm with sauce on the side. Combine all ingredients except ½ tsp of the herbs. Put in a pot and bring to a boil. Simmer until it thickens. Pour the sauce into a serving bowl and sprinkle with the remaining herbs. Serve "Fake Brugers" with sauce on the side.